Also to celebrate Halloween and the lauch of http://www.mrloboshop.com/ Apprehensive Films is releasing a very special limited edition of the fan favorite Cinema Insomnia Halloween Special with Bob Wilkins. Support your local horror host! 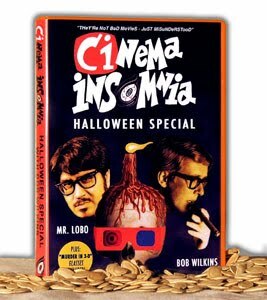 Mr. Lobo is proud to present the lost 2002 Cinema Insomnia Halloween Special with guest co-host Bob Wilkins, the legendary host of Creatre Features. Shot entirely on location at the historic Sacramento City Cemetery, the two horror hosts talk candidly about some of their favorite films including Night of the Living Dead, The Terror From Outer Space and the terrifying classic The Three Stooges go to Virginia. This disc also includes a rare Creature Features Halloween bonus from 1977 and the migraine headache inducing, 1941 featurette, Murders in 3D. Remastered sound on the lost Cinema Insomnia Halloween Special, Bob Wilkins in 3D and Apprehensive Films trailers.